Cool roof coatings are designed to reflect more sunlight and absorb less heat – which can be crucial in the unforgiving Tampa, Florida, climate. Whether it is created using reflective paint or other liquids, a sheet covering, or reflective tiles and shingles, a cool roof can provide many valuable benefits. 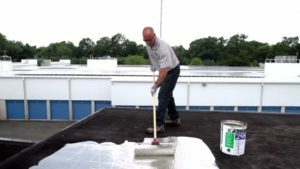 For more than two decades, businesses in the Tampa, FL, area have relied on Elite Roofing Services to help them identify and apply the cool roof coatings that are best suited for their buildings. We use products from top manufacturers, such as Karnak, Gaco Western, and GAF, and our roofing technicians make sure that the job is done right the first time. The cool roof systems we offer can be used for all types of roofs and structures, including apartment complexes, shopping centers, retail stores, warehouses, and more. And, cool roof systems from Elite Roofing Services are backed by comprehensive manufacturer warranties, so you can rest easy knowing your investment in your roof is protected. If you are interested in finding out if the cool roof coatings that we offer could benefit your Tampa, FL, business, contact Elite Roofing Services today. We’d be happy to schedule a site visit to discuss your options.